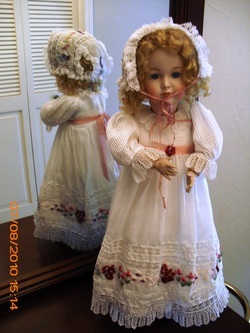 A unique doll named Jody is now on display at the Bartlesville Area History Museum, 401 S. Johnstone Ave., Bartlesville, OK. Jody was made by master dollmaker Suzanne Eder and is garbed in clothing made by members of the Lacemakers Guild of Oklahoma. Jody is now housed in a custom-made cabinet. A detailed account of her history is part of the display. Admission to the museum is free. Hours are 10-4 Monday through Friday except on holidays.